The Traveler's Insurance pavilion presented the two-and-a-half billion year story of life on earth, beginning with the earliest cell and culminating in modern man's leap into space. Under the red dome that symbolized the Travelers umbrella of protection, were 13 dioramas using life-sized models, stage sets and sound and lighting to re-create the most significant eras and events. 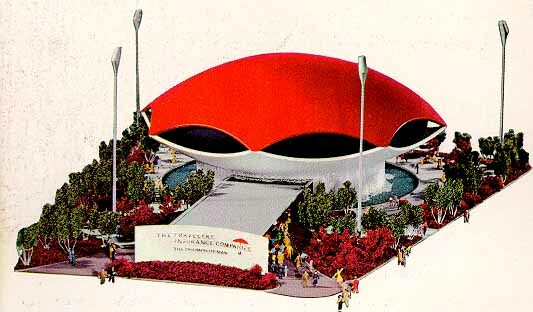 The red domed Traveler's Insurance Pavilion. The approach to the pavilion was through an 80 foot covered walkway, which along its length was a glass and plastic mural depicting the origins of our planet. On the pavilion's ground level was a three-dimensional display that traced the evolution of life from one-celled organisms to early land creatures. The second floor featured a 21 minute tour of 13 dioramas in the Progress of Man exhibit. Man progresses from inventing tools, discovering fire, and developing religion, then developing early farming and cities. The Roman era was shown at its peak, then under barbarian attack. Other dioramas showed the perils of the Black Death during the Middle Ages, the rise of modern man as depicted by Copernicus' theory that the Earth revolved around the sun, Columbus's voyage of discovery, pioneers taming America, and finally man on the verge of exploring space.